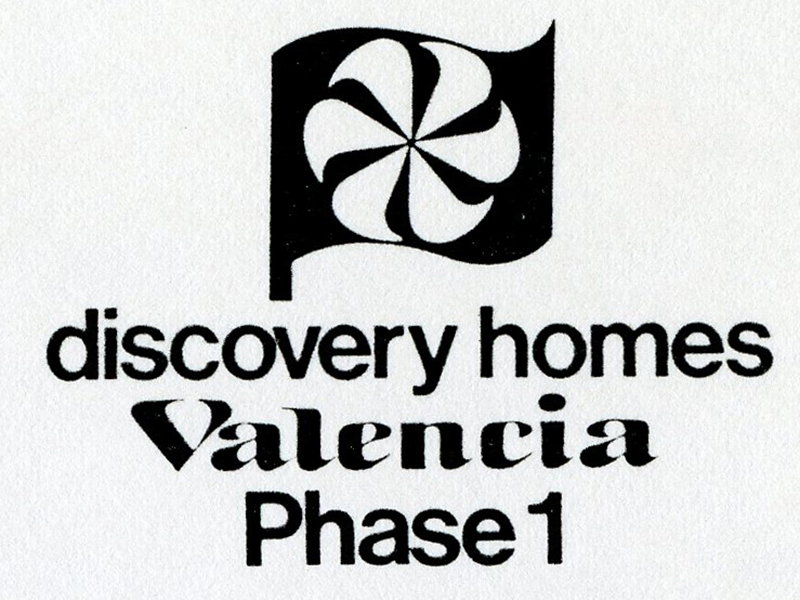 SCVHistory.com HB1821 | Valencia | Meadows West: Sales Brochure & Floor Plans, 1976. Valencia Corporation (a Division of The Newhall Land and Farming Co.), 1976. Meadows West is our answer to those who want more luxury in their Valencia. It starts where our best-selling Meadows series left off ... but this time around we've enlarged both the homes and the lots to give you space to spread out. Or space to plunge in, because all our lots are now pool-size. Once you see our Garden Bath, however, you may not want a pool. We've brought the outdoors in with large bathroom planter areas adjoining sculptured Roman tubs. Lots of daylight, naturally, so your plants will thrive. Big mirrors to reflect, the glory of it all. Double lavatories to eliminate the morning rush. And loads of hanging space nearby for all your clothes. The feature list in back is long. Just about everything you could think of is built in. You will have to make some decisions, such as whether you want a 2 or a 3-car garage with your 2-story home. Or whether you want that extra bedroom to be a den or a parents' retreat. Or whether you want your family room formal, with the shag carpet we provide ... or more casual, with decorator no-wax vinyl. Or whether you'd rather have a wet bar instead of storage space. And you can order an extra hand-fashioned fireplace upstairs in your master bedroom. 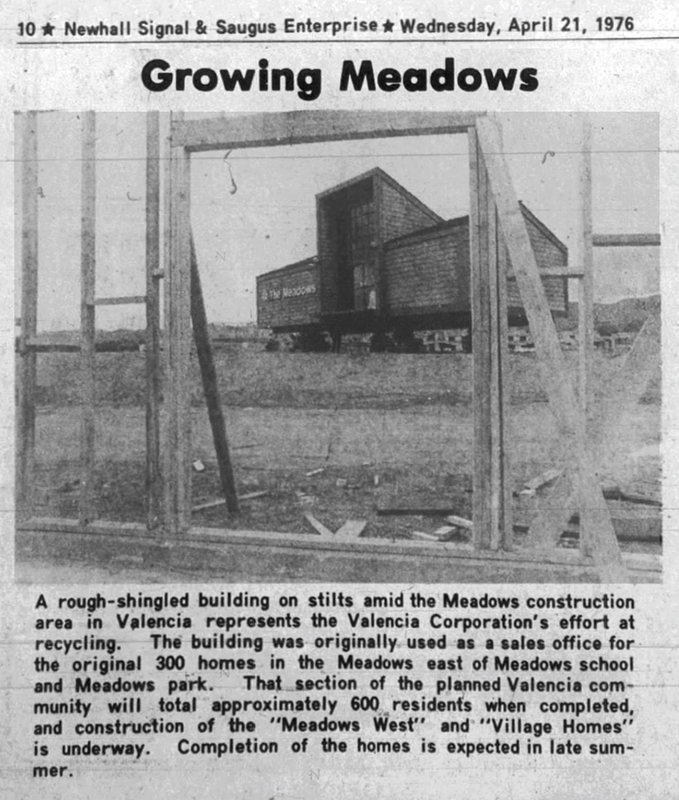 Meadows West typifies Valencia: choice instead of chance. Surprise! No wait! The facilities went in before the homes. You'll walk, via paseo (that's our name for a lighted, landscaped, greenbelt pedestrian path) to shopping, parks, rec centers and elementary school. Permit us to preview what you'll find. Village Shopping Center is a new old-fashioned kind of place. In it, you'll find an olde English-styled pub-restaurant, a general store with its own delicatessen-restaurant for those times when you're having too much fun to cook, a post office, flower shop, drug store ... even an old-fashioned candy store and ice cream parlor. A nice place to wrap up the day before or after an evening at CalArts, the college on the hill across the street. At the other end of the paseo is Meadows Park and Recreation Center, with its large heated swimming pool, athletic fields, clubhouse and playground. Next door is brand-new Meadows Elementary School. Your children can go to the park and school via our paseo system without crossing major streets. For the littlest one, renowned Pinecrest Preschool and Day-care Center is just down the street.